Timothy P. Fagan is a Senior Legal Editor for BLR’s Environment, Health and Safety (EHS) publications, focusing primarily on air quality, chemical management, and hazard communication related topics. 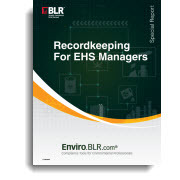 Mr. Fagan has covered EHS developments with BLR since 2000. Before joining BLR, he spent 5 years in environmental consulting and was responsible for air quality permitting and compliance for a broad range of industries in both the private and public sector. He received a Bachelor of Science degree in chemical engineering from Villanova University, a Master’s degree in environmental engineering from the Pennsylvania State University, and a graduate certificate in environmental health and safety from Central Connecticut State University. What did you emit? This is what regulatory agencies across the country want to know. From February through June sources of air emissions are required to submit annual emissions statements or reports to the appropriate regulatory agency quantifying the pollutants they emitted during 2018. The EPA recently found a company in violation of the EPCRA's Tier II and TRI reporting requirements and levied a penalty of over $160,000. Are you confident in your compliance with EPCRA reporting requirements? Now might be a good time to conduct an audit of your reporting procedures to ensure you don’t end up on the wrong end of an EPA penalty assessment. TRI reports: Are you keeping up with the changes? July 1 is fast approaching. So, if you haven't already done so, now is the time to prepare your Toxics Release Inventory (TRI) report. Make sure you are aware of the changes for this year's report. Safety 2018: Knowing vs. understanding chemical hazards—where do we set the bar? The Occupational Safety and Health Administration’s (OSHA) Hazard Communication Standard gives workers the right to know about the chemicals and chemical hazards in their workplace. But is knowing enough? Tier II Reports: What has changed? Will RMP and PSM revisions create more overlap?